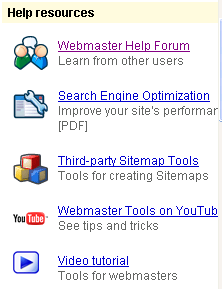 Google Webmaster Tools (www.google.com/webmasters/tools) is one of my favorite tools for diagnosing site issues. The tool just keeps getting better. Over the years, the Google Webmaster Tools team has continued to improve GWT, which has been a tremendous help for Webmasters and Site Owners alike. Ability to Evaluate External Link Inventory - By going to the "Your site on the Web" section and clicking "Links to your site", you can gather an understanding of who is linking to your site pages and trace back either good or poor quality links to your pages. This helps site owners understand which areas of the site are popular and which areas could use some improvement in terms of link generation. Coupled by the fact that you can break this down by page, this is a very powerful feature of Google Webmaster Tools. In addition Google has added the ability to gain insight into the anchor text (linking text) of the sites that are linking to your pages. This can help determine the quality of the links that are linking to your site's pages. Very useful information when trying to improve the inbound link quality to your site. 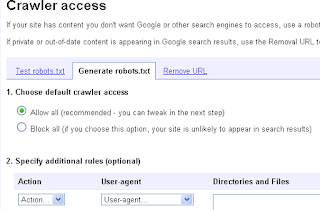 Ability to Set Crawler Access - Accessed via Site Configuration > Crawler Access, Webmasters can create a robots.txt file to specify how search engines should crawl your site's content. Under the "Generate robots.txt" tab, users are four steps away from creating their own robots.txt file to control what content the search engines have access to. Ability to Set a Preferred Domain - under Site Configuration > Settings, you can set the preferred domain of your site to be either the www version or the non-www version. Why is this helpful? Well, the preferred domain is the one that you would like used to index your site's pages. If you specify your preferred domain as http://www.example.com and Google finds a link to your site that is formatted as http://example.com , Google will treat that link as if it was http://www.example.com . In addition, Google takes your preference into account when displaying URLs in their search results. This helps with the whole canonicalization thing. HTML Suggestions - Contrary to some reports, Google still places a lot of value in title tags and meta descriptions. If they didn't why would it be such a prominent feature in Google Webmaster Tools? This section accessed via Diagnostics > HTML Suggestions provides insight into duplicate title tags or meta descriptions, which are not very helpful to the Search Engines in terms of helping them understand what a given page is about. Remember that meta data is basically "data about data". The engines use this information to determine what a page is in fact about. In addition, through this feature, Google will let you know if your titles and descriptions are too short, thereby providing limited information to them. If you want to be considered as relevant content for a given topic, you need to inform the engines as to what your page is about. Title tags and meta descriptions can help your cause greatly. Google Webmaster Tools Help - there is a ton, and I mean a ton of great information in the Google Webmaster help area of GWT. For example, checkout the Webmaster Tools Checklist to help site owners and webmasters set up Google Webmaster Tools properly. I had created my own process for this, but Google has created this handy checklist for you to use. If you are not currently using Google Webmaster Tools on a regular basis, you need to. Put simply, Google Webmaster Tools is one of the most powerful tools that site owners and Webmasters can use to diagnose crawling and indexing issues in Google... and chances are if you have crawling and indexing rules in Google, you may be experiencing the same issues in other engines. Webmaster Tools is available in 40 languages, and will serve its localized version based on your browser's language settings. Some languages also have a Help forum, where you can share information and get help from fellow webmasters and Google representatives. We love the frequency of updates and the constant addition of new features to GWT. One of the main reasons it continues to be our favorite tool for diagnosing site issues. We recommend that all Webmasters and site owners (small or large) become familiar with Google Webmaster Tools and all of the features associated.